With a priority on improving the housing stock owned by the council, older properties had to give way to new housing estates in Tilbury. 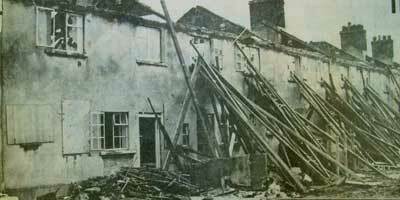 This required the demolition of Poets Corner in the north part of the town. I lived at No. 20 Thackeray Ave. We left in 1972/3 and moved to Grays. My dad Ralph was a dustman, in the days when they went into your garden, lifted up your bin on their shoulders, walked to the dustcart and emptied. Then they would put the bin back. Had many good memories there. Neighbours were The Coleman’s, The Strongs, The Tethers, The Heaths, The Sharkys, ….the list is endless. Lots of people in surrounding roads I remember too! I lived in Kipling Ave for years. I always used to play football on the green in Shaw Crescent with Dennis Sheriden, Stephen Pearson, Alan Prior, Paul Pearson, Colin Heath and Derek Ross, wonder where he is now???? I was born in the house my mum still lives in 48 years ago- 41 Dickens Ave – she is the second oldest resident in the street. The first being Doreen Smith at number 47. I also went to manor way as did my brothers Anderw and David. I loved playing in the houses when they were being knock down! I lived at number 46 Kipling Ave,. . My mum and dad were Liz and Harry Jackson. We lived next door to a mr and mrs Livermore,next came a lady called Nell Grant and then a man called Reg with his sister Pam. . . Our house was on the end and the opening to the back field was at the side of us. In the summer, we would play all sorts of games on the field and children from Parker, Fielding and Shaw Crescent would all come to join in. . We lived there from around 1966-1978. Brilliant memories. i lived in kipling `the wrights family opposite jimmy lee, it was a good road and many friend but all that has gone now ! I was born in 1960 and live in Kipling Ave from 64-68 by my reckoning, so must have been at school with Linda Tucker! I moved into 12 Dickens Avenue after the floods in 53 and went to Manor way,When my mum died in the same year I moved in with my Aunt Flo in Tennyson Ave. My Dad remarried and I moved back in 55 and then up to West Ham in 58. I remember Dawn Grant we you to sit next to each other in class at Manor Way. I also remember the horse because it lived at 12 and was there in the window when I showed my wife to be where I used to live she was unimpressed as you can imagine. I lived in Burns Place from about 1952 until I married in 1968. I actually lived across the road from my future husbands grandparents, May & Laurie Tindale. I remember the “Red Hut” very well, as I do you Jannette and Mary Downward, Carol Benson, Dawn Grant, Lynn Allen, Sally Pritchard, also Barbara ? can’t remember her last name but I think she lived next door to Carol Benson. I remember the film and the rock and roll nights and also the little tuck shop. They were good days.. I have lived in parker ave for just over a year now. seem like a nice place but have found out it had a past of old buildings. its good to see this photo i would love to see so many more. i know the area had a bad rep as does most of Tilbury but i live there and have found most people ok. its a shame the old places went. where did all the people go. When i dig in the garden i find old bit of rubble from what i now know to be the old houses on this site. I lived on the corner of Parker Ave and Kipling Ave. We had wonderful times there growing up. My dad Stan Gibbons ran the “Red Hut” youthclub along with Jimmy Grant and Charlie Smith, all voluntary. The Red Hut was and old red corrugated church (All Saints) in the field behind Kipling. Dad used to get old films like “King Kong” and new records with the subs money. Lots of rock n roll nights and all were welcome. It kept many kids off the streets where they would be looked after. He also ran bingo for the mum’s in the afternoon. I recall this scene very well, I lived in Dickens avenue all of my childhood so know Poets corner very well. I could see the demolition from my back garden of Thackeray Avenue and Burns Place – at that time there were still a lot of “rag & bone men”in Tilbury (i went ringing the bell with a couple of them)! and they had a field day with the copper and lead from the old houses i remember riding my trail bike over the rubble and debris and have vivid memories of walking down Kipling Avenue, up Parker Avenue and down Fielding Avenue past all of the empty houses – eerie and a bit sad having known many of the former residents – at the rear of Thackeray avenue I helped build a dirt track with old tyres for use by the local kids to race their bikes around, it was very popular until the council authorities came around and cleared it all away !